Do a Google search for “home flooring” and store after store will pop up. There’s no shortage of retailers who want to sell you carpet or hardwood or tile…but that’s all they do. They sell you the floor, sometimes – but not always – install it (usually as quickly as possible), and they’re done. Let’s start with choosing a floor. In many stores, you walk in, look around a lot, maybe do some research on Google, and make a decision. You think (hope…OK, actually worry a little, but go with it anyway) that you’ve chosen what’ll work in your home with your family. You’ve gotten little to no help in this search from the flooring company – it’s just not part of what they do. They sell floors. You’re on your own to figure out what floors. Then let’s talk actual flooring. In the flooring world, you get what you pay for – the cheapest rarely equates to the best. But for big box stores needing to hit certain budgets at certain times, it’s all about moving inventory, and the flooring quality can vary widely. Ambassador Floor only partners with manufacturers offering the highest quality flooring, so no matter what you buy at Ambassador, you know the quality will be there. That’s important – not only because you obviously don’t want to waste your money on cheap floors – but because flooring is a significant investment in your home. It’s where your toddler takes her first steps. It’s the background for endless hide-and-seek games with your kids on rainy days. It’s where your teen daughter takes her first wobbly steps on high heels for her first dance at school. It’s the palette of the canvas that is your home where you raise your family and make the memories that help define a family. Ambassador Floor understands that. We respect the investment in your home by adding quality, experience, and expertise to create floors worthy of your home and family. For more than 30 years, we’ve helped individuals and families create a beautiful, lasting foundation for their everyday lives. And that’s what we mean when we say there’s oh so much more to flooring than just floors. 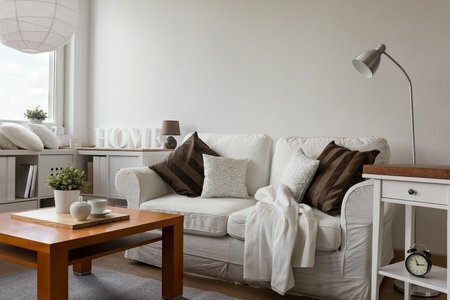 Homeowners tend to use neutral-toned rooms because they remain in style and they are easy to decorate. 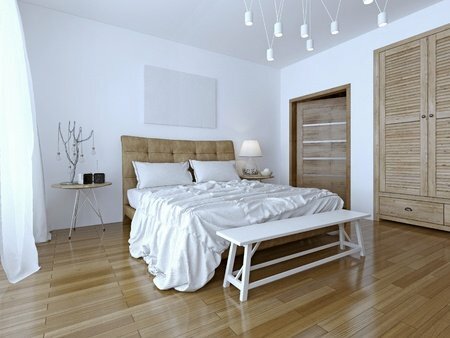 Whether it is your bedroom or bathroom, we understand why homeowners shift their focus towards a neutral color palette. To help you master this look in your bathroom, we have came up with ten neutral color palette ideas for you to use. Let’s take a look! A classic neutral toned color palette contains warm colors. From burnt oranges to beiges, your bathroom can become a cozy paradise. These warm hues will help to make your bathroom more comfortable and relaxing. Just add a couple of candles and you will never want to leave this paradise. A fan favorite has always been the classic black-and-white color scheme. Luckily, these colors will never go out of style; therefore, you are guaranteed to have an in-style bathroom. 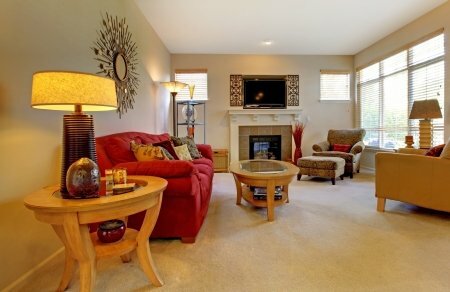 Plus, these simple colors help to create clean lines and make the room appear well-kept. In recent years, homeowners have begun to incorporate texturized backsplashes into their bathrooms. Texturized backsplashes help to add style and uniqueness into a space. This intriguing piece will add personality into any bathroom. Embrace nature’s favorite neutral: wood. Wood can be the perfect accent piece in any neutral toned bathroom. Be sure to ask our sales associates about our flooring that looks like wood, but works inside of a bathroom! Trend Alert: White Subway Tiles. Embrace this trend by creating a beautiful and clean white backsplash with subway tiles. The chic looks do not stop there! Spruce up your countertops with a marble-finish. Plus, with budget-friendly options available, you can have the look of marble without paying for marble. Using only neutrals does not mean that your bathroom needs to be boring. You can instantly spice things up by using patterned wallpaper. Patterned wallpaper helps to bring life back into the space without taking away from the room’s design. If you are a fan of color, you can still have the fun of color with a neutralized color. For example, you can use the color blue within your room, but make sure that you tone it down into a neutral-tone of blue. If you need assistance, ask your local paint store representative to help you find neutral-toned colors. We love metallic accent pieces and now is the time to embrace this elegant look. Try incorporating metallic pieces into your bathroom’s hardware. You will see that metallic reflects beautifully off of a neutral color palette. If your heart is not set on a warm-tone color palette, you could always try a cool-toned palette. Grays and whites will help to make up your cool neutral palette. Just be sure to add pops of muted color like blue (neutralized color) to help tie together the space. Are you interested in learning more about neutral backsplashes and flooring options for your bathroom? We would love to assist you in the selection process! Contact us today or visit our showroom! 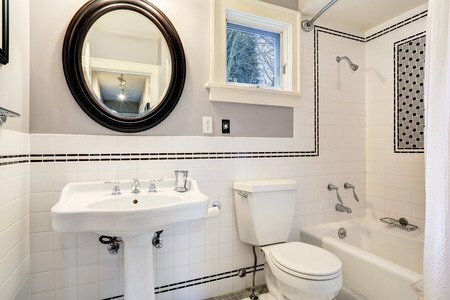 What does your perfect bathroom look like? Often, when envisioning a chic bathroom we rarely give attention to the mirror. After all, when we look in the mirror we see a reflection of so many things but we rarely pay attention to the mirror itself. Yes, a good mirror is an important component of the overall look of a room especially a bathroom. You can choose from many different styles, shape and colors. – If you have a store-bought mirror than you’ll want to take the 70 to 80 approach. The mirror should be 70 to 80 percent as wide as the vanity. The mirror will look smaller but not shrunken. – A functional mirror needs to only be a foot above your eye line. However, the taller it is the more viewing angles you’ll have. If you have a super wide vanity or a double sink vanity than you’ll have to decide whether you should invest in two vanity mirrors or one with double the width. If you use two, skinny, long mirrors you will emphasize the height of the room. Multiple mirrors also work with vanities with a single sink. On the other hand, using a single mirror with increased width will open up the room. For a dramatic look, you can completely ignore the size of the vanity and opt for a mirror that covers the entire wall above the vanity. A wall to wall mirror can visually double the size of a small bathroom. Frame or a frameless mirror will work in this space. However, frameless mirrors are often used in the bathroom because it creates a modern look. Whether or not you live in a small home, you may find yourself struggling for extra counter space in your home. From the kitchen to the bathrooms, counter space is limited and you are running out of ideas. But there is no need to worry because we have four simple tricks to help you free up counter space. Trick One: Just Look Up. 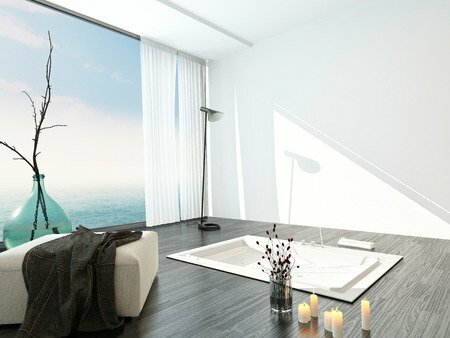 Counter space tends to be limited, but have you ever thought about using your wall space? Installing a shelving system can be just what you need to maximize your home’s storage. Plus, installing a shelf can work in literally any room of your house. From your kitchen’s spices to your bathroom soaps, shelves have you covered from the ceiling to the floors. Trick Two: Double-Duty. Doors hold a lot of storage potential and they can help keep your home looking tidy! Install a door organizer to the back of your door to store all different types of items. Your pantry door can hold extra food, your laundry room door can hold detergent, and your garage door can hold cleaning supplies. All you will need to do is group the items into different categories and place them on the appropriate door organizing system. It is a smart idea to keep chemical cleaners outside of the house and in the garage. Trick Three: Stack Em’. 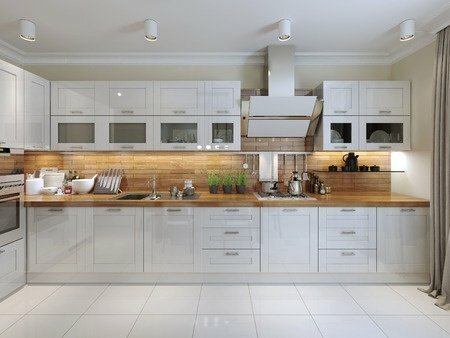 If you afraid of losing too much counter space, try storing vertically instead of horizontally. Bins and baskets that stack can save homeowners more room than storing them horizontally on top of their countertops. You will want to try and look for stacking systems that can store your household items without sacrificing counter space. Trick Four: Out of Sight, Out of Mind. Instead of storing items on top of your valuable counter space, consider stashing them away in hidden places. The area underneath your beds is a great place to start! Depending on what room you are working on, you will be able to find a lot of nooks and crannies to hide your items. We hope you enjoyed these four quick and easy tricks to free up counter space. When your countertops are open, let us know if they also need to be updated! We are always happy to help. Check back each week for more posts, updates, and blogs! Tip No. One: Have A Set Schedule. If you live with big family, it may be a good idea to make a schedule for getting ready in the morning. This will help create more space for the one person using it at that time. Discuss what times work best for each family member then post it outside of the small bathroom. Essential things like using the shower or bathroom should only be scheduled and encourage them to use their bedrooms for other stuff like makeup or getting dressed. Tip No. Two: Have All Areas Covered. Tip No. Three: Get Rid of Bulky Containers. 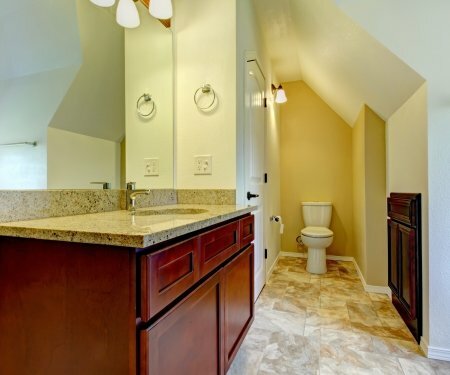 Bulky bottles and containers can take up a lot of room in your tiny bathroom. You can switch over to using a wall-mounted shampoo dispenser in your shower. Also, you can store your q-tips, cotton swabs, etc. in mason jars to get rid of their bulky packaging. We hope you enjoyed these tips and tricks for your organizing your tiny bathroom! When you start looking to replace your bathroom flooring, please give us a call. We have a great selection available at a reasonable rate! There are a lot of great options out there for home flooring. It can become a bit overwhelming thinking about all the material choices you can comb through in search of the right one for your space. A wonderful idea for your floors is laminate and it shouldn’t be overlooked. Modern laminate is fresh and stylish. Here are a few reasons to appreciate this choice in flooring material. Cost-Effective: Laminate is an affordable alternative to natural stone or hardwood floors and you can still get the look you want without the price. Choose any color, grain or pattern you like and you won’t be paying extra for a more exotic selection. Even if you just want to go with a tile look, you’re covered. Sustainability: When you choose this flooring, there’s no need to re-seal floors every six months. No waxing or other special cleaners needed either. A broom or a soft mop with warm water is all that’s required to keep your floors shining and dirt-free. 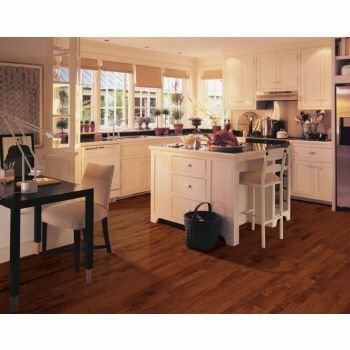 Laminate’s stain-resistant surface is especially helpful in rooms like the kitchen where frequent spills can happen. Stability: This material is scratch-resistant which is great for high traffic areas. Households with children and pets can feel confident that these floors can stand up to the daily wear and tear of life. With proper care, you can enjoy them for years to come. Attractive: Using a photograph of the material you are trying to imitate on its top layer is how this flooring performs its magic. With all the available looks out there, you are bound to find a pattern that works for your home. You can also have peace of mind knowing that laminate does not fade over time through exposed sunlight as other materials do. So, if you are still searching for a flooring option that can give you a great look for an unbeatable price, look no more. Laminate is the material you need for the price you want.